“Have a heart,” I said to myself as I watched the anxious driver in front of me swerve and honk angrily at a timid driver attempting to navigate a rather confusing roundabout. I was on my way to a hospital to visit one of my members early one morning when I came upon the unfortunate scenario of this first-timer in need of a little patience from her fellow travelers. Unfortunately, it wasn’t to be, but what followed, I must share. Because the roundabout comprised the exit that would lead me to my destination, I was moved to stay close to the irate driver hoping that his stop would be the same as mine. I was on a mission to find out where he was going and maybe even discover the reason for his hurry. While following, I felt only a slight pinch of guilt for what could be the perception of other drivers as I hugged his bumper and used him as somewhat of a blocker through some pretty tight traffic. Surprisingly, he didn’t even seem to notice my presence as he ducked and turned, cutting left and right, accelerating with such ignorant carelessness. Looking back on the event, I can see the faces of the other drivers. Each offered him an irritated gaze, but for some reason, I was given a pass, and I don’t think it was because I was wearing a clerical collar. With my coat zipped up, the collar is nearly impossible to see. I think it was because there was a general consensus that I was following him and had a mind to bring about justice. I’m glad I didn’t attribute that particular possibility to my pass at the time because knowing my own tendencies, I may have been rallied by the silent cheers to fight the fight for others. The chase didn’t last very long. It was only about two miles to the hospital entrance. Nevertheless, I could see my turn before me and I started to slow down. He didn’t, and so I thought the race was done. But without braking, he turned left into the same hospital drive that would receive me. He cut in front of an oncoming car while I was forced to wait. Eventually I turned. I gave the accelerator a little more this time and was able to get into the same parking lot as he (which happened to be some distance from the lot that would have served me better). He circled looking for a parking spot. I did, too. Eventually he settled on a parking place somewhat distant from the building while I was graced by a departing vehicle at least fifty parking spaces closer. And here is where it gets interesting. “This is brisk when it is so cold,” I offered the well-dressed businessman. “Feels like I’m always in a hurry,” I led. “Yeah, I’m running a bit behind,” he said to bring the conversation to a conclusion. I gathered from this clue and others mentioned before it that he was in a hurry because he was late for work. He increased his stride to get away from me. “The Lord’s blessings in your day,” I offered as he took the lead. “Thanks. You too.” We both made our way into the building; me to the hallway that would take me back to the correct wing of the hospital, he through an office door in the same hallway. 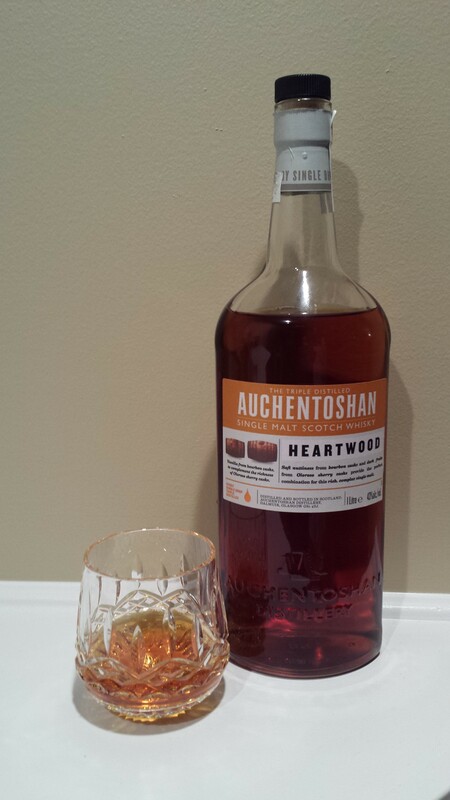 And this brings me to the Auchentoshan Heartwood. The Heartwood is calming and pleasant. It is meant to be shared. When the gate is opened, the nose receives a friendly whisky. The vanilla noted on the label is there, but it isn’t alone. It is walking in stride with another, sweeter element — pecan pie with a warmed crust — something to be shared. The palate changes course significantly, offering notes of something a bit more like lemon meringue; again fresh and meant to be shared. The finish brings back the warmth, heralding the sherry you expected in the nose and palate, and it is a bottle you’d prefer not to drink alone. So why the lengthy introduction to this review? Well, as I mentioned, I think the folks in the cars around me that morning truly wanted me to catch this guy and give him a piece of my mind on behalf of the morning commuters, but I didn’t. In fact, I guess I’d have to say that if the opening scenario had a different context, I would have offered the man a blessing as well as a dram of the Heartwood. As I said before, it is calming and pleasant and meant to be shared, which is just what this guy needed. Now, I know that he was the villainous character, one who was concerned only for “self” at the expense of the joy of others around him, but I offer to all that when you want someone else to “have a little heart,” the best remedy may actually be for you to join them, walk beside them, and take the time to give them a little bit of yours. That brings a better justice, and perhaps it will set the stage for a scenario where you won’t be drinking alone, but with a newfound friend.